Island of the Gods Part 1. Normally my girlfriend Ellen and I stay for holidays in more or less nearby countries like Germany, Belgium, France or Spain. But we had saved some money so this year Ellen, who has travelled much more and further as myself, wanted to go far away from Europe again. Ok, I said, where precisely do you want to go? 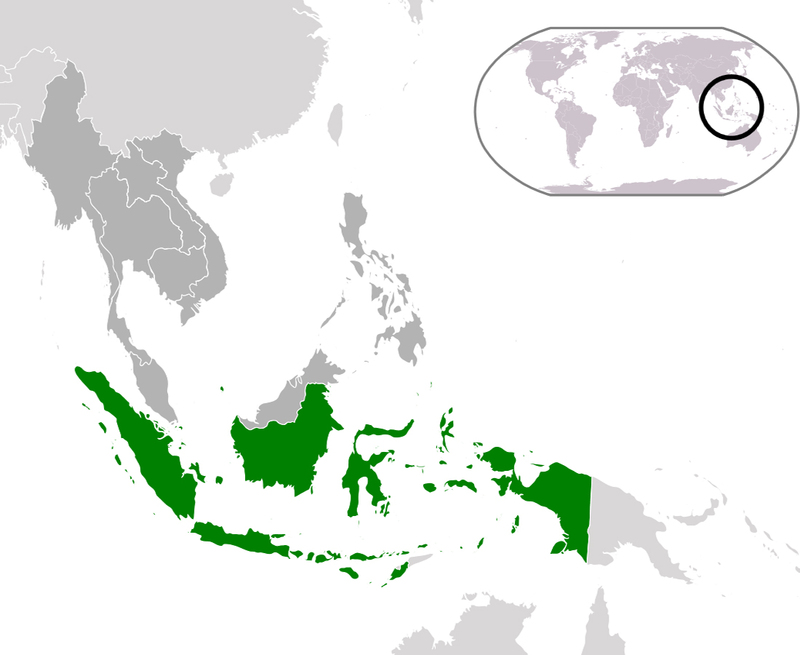 Since we both have a preference for Asia the choice was pretty easy: former Dutch colony Indonesia. We checked some travel agency sites for round trips but I had a bad feeling with them. Being in a group of other Dutch tourists, doing things together, frequently travelling long distances with them in cramped vans and visiting overcrowded tourist attractions is not my idea of a vacation. I want to be able to choose my own tempo, see as few tourists as possible, meet the locals etc. On the wish-list of Ellen was visiting the Borobudur, experience a sunrise from a volcano and see orang-utans in the wild. Luckily a niece of mine (who also happens to be my godmother) had a tip. 2 years ago she and her husband (who comes from the Indonesian Maluku Islands) went to the island of Bali to the bed & breakfast of (Dutchman) Marcello Supusepa, Home Bali Home, in Jimbaran and had a great time there. 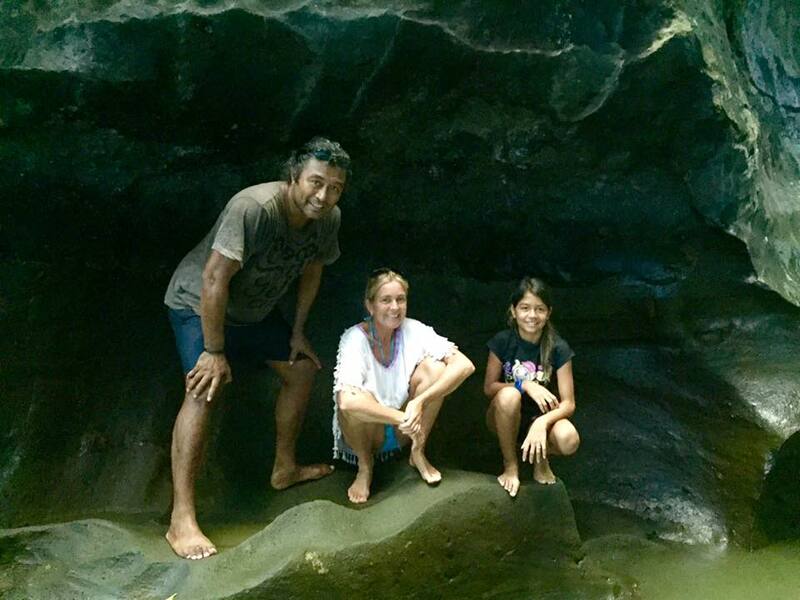 Marcello also has a travelling agency, 888 Pure Travel, which organizes trips throughout Indonesia, so my niece said that I should send a mail with the wishes of Ellen and me. No sooner said than done or we had a reply. Marcello suggested that we made a scooter round-trip through Bali (and see amongst other things the mini-Borobudur), shortly visit the Kawah Ijen volcano in East Java and travel to Kalimantan to go on a boat and see orang-utans. It all sounded good to us, the price was ok so we booked the 3 weeks trip. 5 May Ellen and I packed our belongings and went to the train station in Olst, the journey had begun. Amongst other things I had brought with me 4 corncob pipes, a Zippo pipe-lighter (with some fuel), a tin of Vooroogst tobacco, a tin of Flatlander Flake, Samuel Gawith Elmo’s Reserve snuff and some Oliver Twist tobacco bits. Of course I had the last 2 items in my pocket and the rest in the hold baggage. At the Cathay Pacific desk where we had to hand over our luggage we were lucky. The evening before I checked in online but there were no more seats beside each other available. Oh well, I thought, so be it. But the nice lady behind the desk offered us 2 places together at the emergency exit. That means more leg space so of course we gladly accepted it. I had never been in a long flight before (the longest was to Egypt, about 5 hours) but 11 hours… Pffff… Luckily I could watch movies and series and before I knew it we arrived at our first stop, Hong Kong. Sadly the transit time was too short to visit Hong Kong city so we stayed at the airport where I took a stroll. As a (pipe) smoker you can smoke at the airport, they have special smoking rooms. Although I won’t advice going there. They are small and overcrowded with nicotine-needy cigarette smokers, just look at this video.. In the tax-free shops I could find some pipes and tobacco to my amazement. Although pretty expensive, Davidoff pipes and tobacco and Dunhill tobacco. After another 5 hours of flying we arrived at the destination: Ngurah Rai International airport near Denpasar, Bali. Marcello was already waiting for us above the busy entrance hall but had some trouble spotting us. After some texting we found each other. “I was looking for a bald man and now you are wearing a hat!” he said with a big smile. Marcello is a jovial, friendly and easy going type of person with a good sense of humour. We put our bags in the back of his car and he invited me to sit in the front. I opened the door, saw the steering wheel and so and while laughing Marcello said “Oh? Do you want to drive?” Ah yes, they drive on the left in Indonesia so in cars everything is also reversed. I was glad I did not accept his offer because the traffic we encountered on the way to his Home Bali Home bed & breakfast, woww… Chaotic busy.. Suddenly it occurred to me that the scooter round-trip through Bali wasn’t going to be a walk in the park.. When we arrived at Home Bali Home after a short drive I made a capital mistake. My hands were full with bags so I put my hat on the statue of a Buddha with the intention of getting it later. We put away our luggage in our lovely room, changed into our swimming clothes, went for a dip in the pool and relaxed the rest of the evening. The next morning I suddenly remembered my hat but it was gone. I asked Marcello and he said that was not a smart thing to do of me. He is not really religious but his staff is (all of Bali is!) and putting a hat on a Buddha statue equals putting a hat on a statue of the crucified Christ for example. Probably someone of his staff just threw my (expensive) hat away.. Whoops.. But I could not blame them, my mistake, it was a good lesson. The first days, before we were getting our Indonesian driver’s license needed for the scooters, we were being driven around by Tata, our Balinese driver. We visited a Buddhist temple, a beautiful part of the coast with some high waves, did some necessary shopping (we needed a powerbank for our smart-phones and snorkel gear) and ate at a warung. I really came to love those places which you can find all over Indonesia; delicious, traditional, rustic, local and cheap food. Often we dined for no more than €2 per person, including drinks! Heaven for this cheap Dutchman. 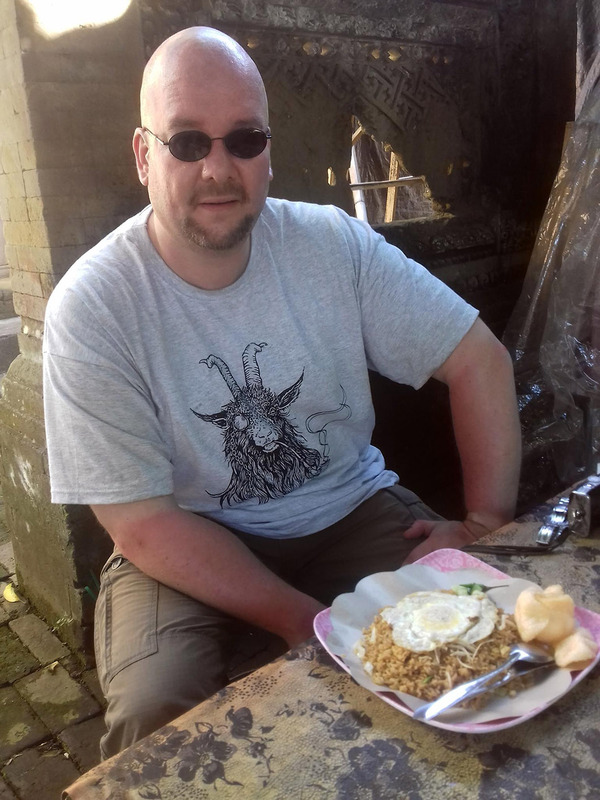 And being Dutch we already knew a lot of the dishes offered since, I said it before, Indonesia is a former colony of us and many Indonesians started restaurants here. Dishes like Nasi Goreng (fried rice with small pieces of chicken/sea food, vegetables and egg), Ayam Goreng (fried chicken), Sate Ayam (chicken on a stick with peanut sauce) and Babi Kecap (pork meat in kecap sauce) were no stranger to us. But if you go to a warung, go early or have a late lunch. The food is made in the morning so most places close around 18:00 pm because the Indonesian hot climate and stuff to eat does not mix well..
Before we went to Bali I searched on the internet for a group of pipe-smokers there, but could not find one. When I am in another country I always love to meet local pipe-smokers. 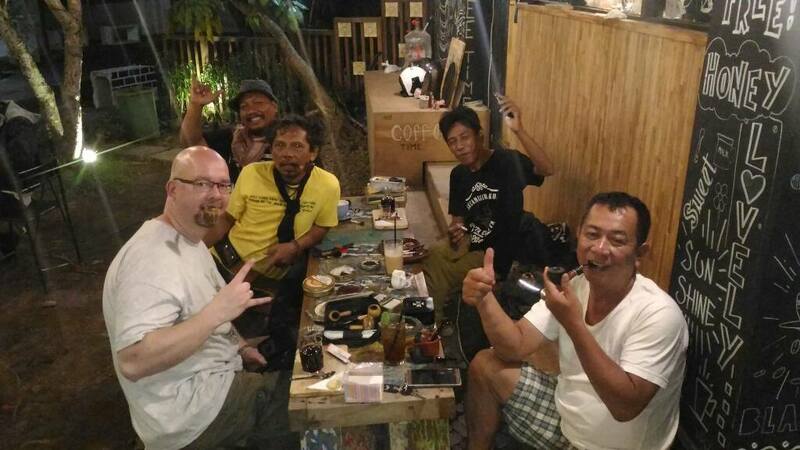 However, there was a facebook group of Indonesian pipe-smokers and they pointed me towards some Balinese ones. I addressed one of them, Handoko, and he was being really nice to me. A smokers group, Bali Tobacco Lovers, existed but getting pipe-tobacco on Bali was impossible. Cigars and cigarettes were available but there were just too few pipe-smokers to make it interesting to sell pipe-tobacco for any vendor. 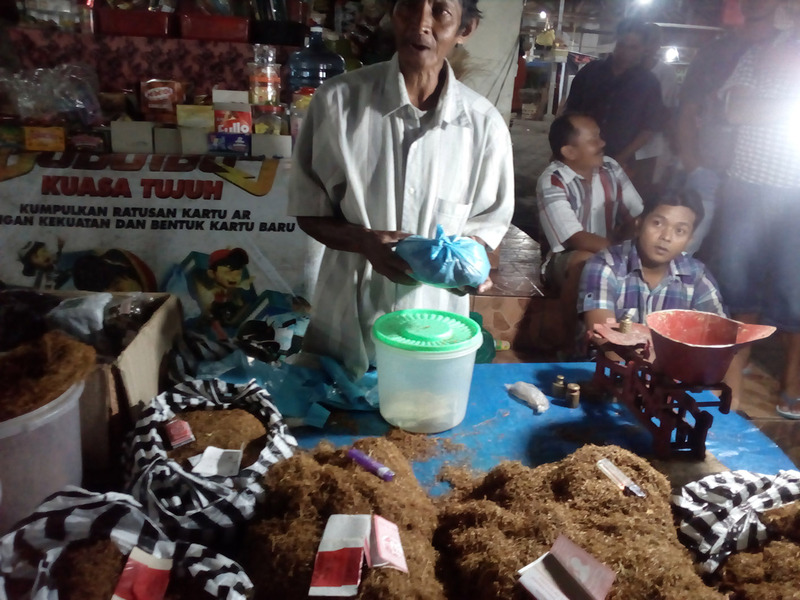 I also asked him about Soppeng tobacco, which I had read about in this excellent article. But alas, Handoko had heard about it but it was not available on Bali. Handoko also mentioned that cigars were available at most Circle K supermarkets. So when we encountered one I could not resist asking the clerk inside if they had some. He produced a few thicker cigars, I am not sure if they were short- or longfillers, but they were expensive, almost Dutch prices. And I just wanted thinner, simple and cheap Indonesian made ones. Also at some other Circle K supermarkets I was not successful, bummer! After we had lunch Tata was smoking a cigarette. Normally I really dislike cigarettes (one of the best things I have done in life, getting rid of the cigarette addiction) but this one actually smelled pretty nice, a bit like clove. 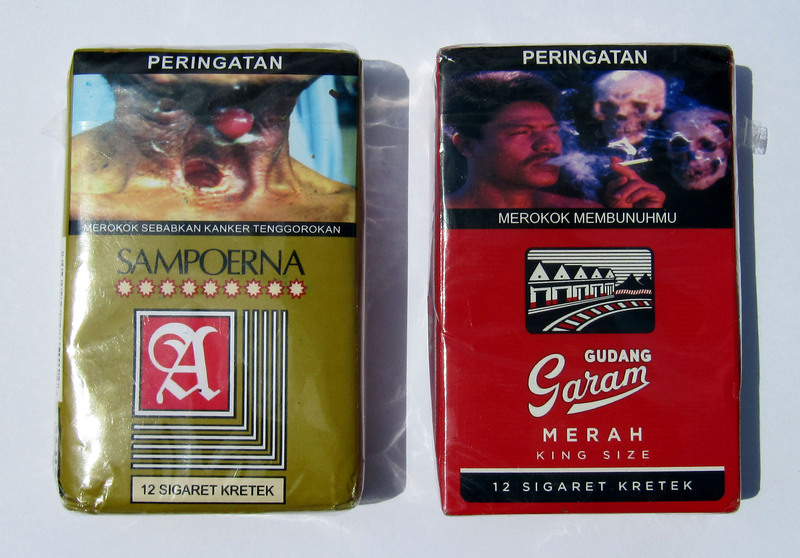 I grabbed his pack, looked at it and saw “sigaret kretek“. I could have one, lit it up (while not inhaling the smoke) and I immediately liked the taste; tobacco with smoky and slightly sweet clove. So later I bought some packs myself, ideal for a nice quick smoke when I did not have the time or patience for a pipe and did not feel like snuffing or chewing. In the evening we went to buy an Indonesian SIM card (really cheap and having internet everywhere was mandatory for our coming scooter trip) and just as we calmly walked along a street Tata enthusiastically shouted at me “Mister! Mister! Look! Tobacco!” and pointed toward a small stall. He already knew I smoked pipe and was looking for tobacco. There were all kinds of loose tobaccos, finely cut but perfect to put in a pipe. Through Tata (who functioned as a translator) I asked the old man behind the stand where his tobacco came from: Java, all of his tobaccos came from there. And which tobacco was the best he had? With a big smile he pointed to a heap and said: just like Marlboro! Ehrrr, well, needless to say I took something of his “second best” heap (even in my cigarette smoking days I avoided Marlboro like the plague, yukyukyuk..). To my nose a grassy Virginia with a bit of an exotic smell, interesting! The price was to laugh at for Western standards: about €1,25 for 100 gr. And I did not even try to haggle! When I put it in my pipe back at Home Bali Home I was pleasantly surprised. A mild smoke (no bite at all) with a fascinating flavour, a bit like a Virginia with a tiny little bit of Lakeland aroma. Normally I am not a fan of that but now.. Only thing was the nicotine content, whoaahh… It blew me out of my slippers! The next day Marcello had arranged that we were going to get our Indonesian scooter driving licenses. 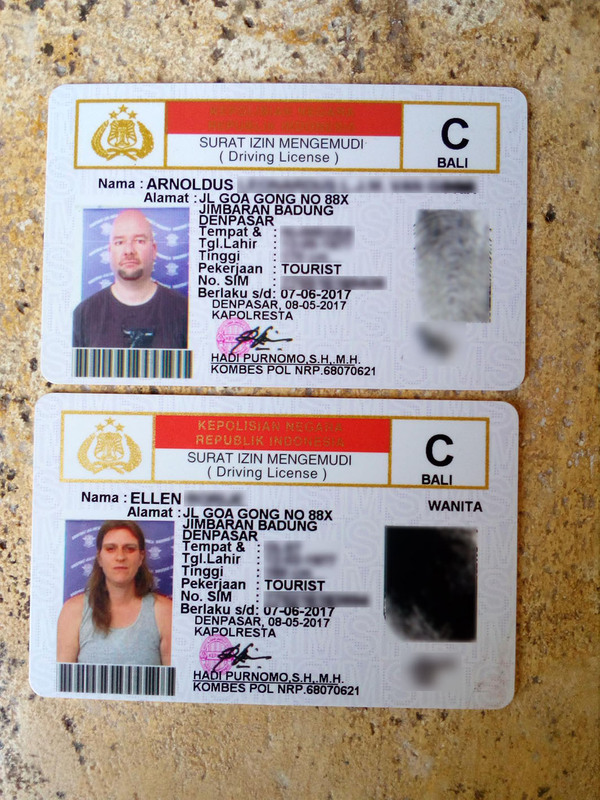 A regular Dutch driving license is not enough since Indonesian scooters are qualified as motor cycles (the bloody things can go over 140 km/ph!). All we knew was that we had to go to the Denpasar police station. Indonesia is a kind of country where you can still “arrange” things if you have enough money and know the right persons. And that is exactly what happened. The driver who brought us turned out to be a kind of Indonesian CIA agent. He dropped us off at the police-station and said we had to wait. Soon an officer walked outside and asked “Mr. van Goor”? Yup, that is me. Ellen and I followed him inside where there were lots of waiting rooms packed to the brim with Indonesian people. We went upstairs into an overcrowded room with 1 officer behind an old computer. All the files on his desk were immediately pushed aside and ours were placed there. A picture was made, a fingerprint was given and we had to write down our autographs. All under the eyes of the many Indonesians in the room, we felt pretty embarassed to say the least. After that we went down again, there was a large desk so we thought we had to wait there. Some minutes passed by when the first police officer showed up again. “Your friend is waiting outside.” But we did not have the licenses yet.. “Your friend is waiting outside.” Ok, we went outside and lo and behold, there was our CIA driver again. With the licenses. Back at Home Bali Home the scooters already were there so we could practice. 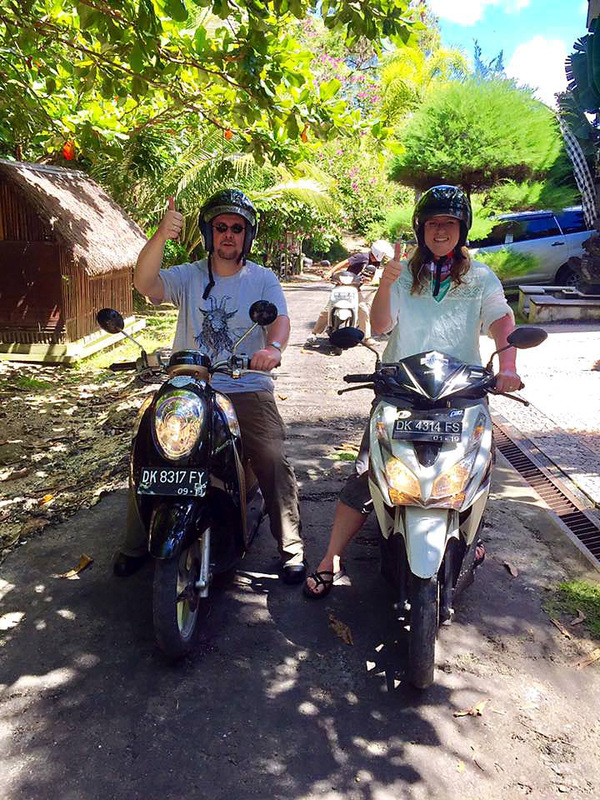 I had never driven a scooter before and Ellen only had some experience on a moped. Luckily Tata rode with us to teach us the finer points of driving on Bali. Almost immediately our new driving licenses came in handy. The South of the island is infamous for its corrupt police officers (really??) who like to stop tourists on scooters (who almost never have the correct driving license) and extort money from them. About a kilometre on our way we were stopped by some police officers. “Your ID”, one of the policemen said with a grin that read “I am going to get soooo much money out of you.” So I showed him my fresh driving license and I really wish I could have made a picture of his face. His eyes were full of unbelieve, how the hell did that fat, white tourist get such a thing?? He was so surprised that he almost saluted me when he gave back my license. Kind of logical, tourists don’t get those thing easy, so when one is in possession of one it probably means he has friends in high places, higher than a common police officer that is. 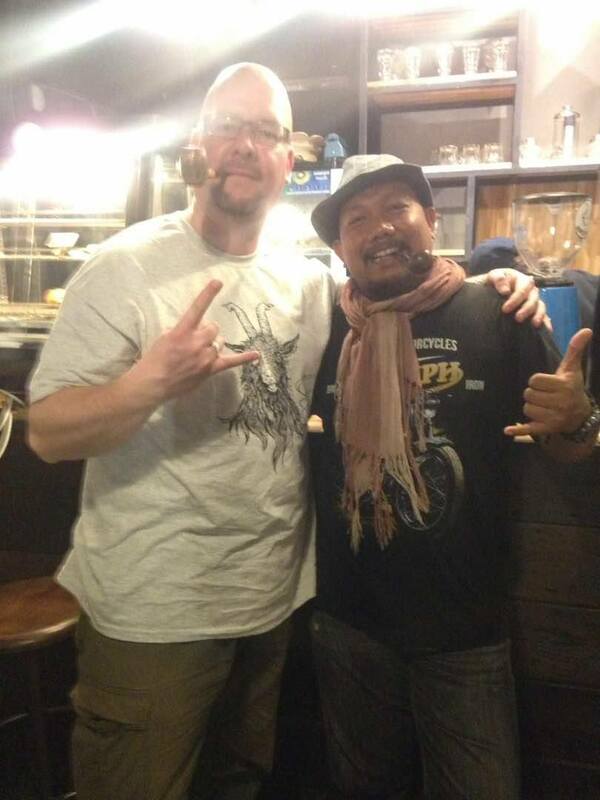 That evening I had an appointment with the Bali Tobacco Lovers group. Earlier Handoko referred me to Endi, the organiser of the group and owner of Kopi Zeen, a coffee bar in Kuta. I was very welcome there and he tried to get as many members to attend. When I arrived I was not sure I had the right place but Endi recognized me and he greeted me warmly. Proudly he showed me his coffee bar and of course I ordered an (excellent) Indonesian cup of the dark liquid. We sat together and I showed him my tin of Vooroogst. On the lid it says “Java Lumadjang Pijptabak” and Endi almost fell out of his chair when he read it. “I grew up near there!” When the others of the Bali Tobacco Lovers group arrived he let them all see the tin. Also I gifted them the tin of Flatlander Flake. They knew Samuel Gawith but for some reason it has a reputation of strong tobaccos there. The pipes they brought with them were not spectacular, what we would consider as B-brands in the West. Although some of the members owned Dunhills! Also they had several ok looking Indonesian made pipes of makers I never heard about. 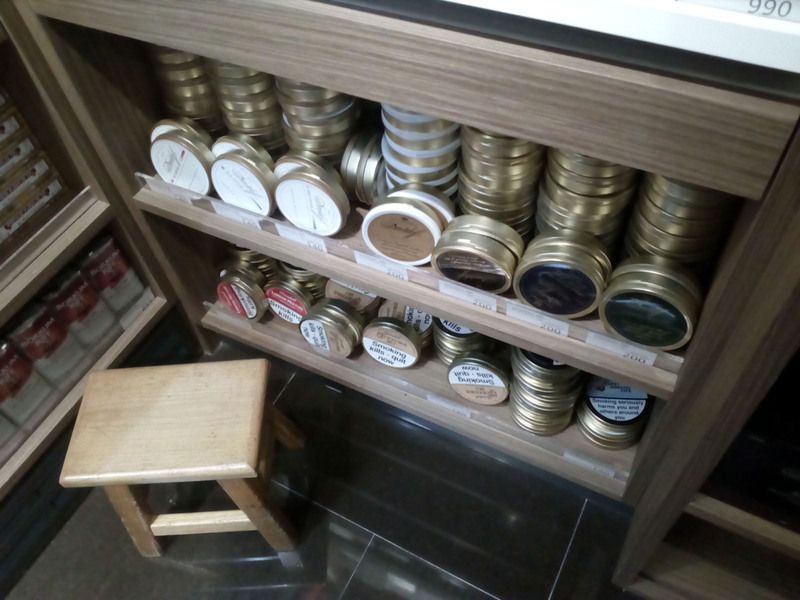 I was a bit surprised at all the pipe tobacco tins the members brought with them like Sillem’s Black, Erinmore Latakia Supreme and some MacBaren ones. But it was not easy for them to get those. They have to order them online at high (Western) prices in tobacco shops in Indonesia or other countries in Asia. A colourful member, Monoss, complained to me that they could get about every tobacco in Indonesia except latakia. Together with other members he had recently bought a bag of 1 kilo of latakia somewhere for quite some money. “Can you buy latakia cheap in Belanda (Indonesian for The Netherlands)?” he asked me hopefully. Sadly not, I also have to buy it in the USA.. Also a lot of home-blending is done with the various import and local tobaccos and I discovered the Balinese have a taste for “smoky-sweet”. So latakia with a bit of sweetness just like Sillem’s Black or HU Tobacco’s ChocoLat. Endi had a home blended mixture with some added wine which tasted good. Monoss also made a blend of his own, I can best describe it as an Indonesian Balkan blend. It was absolutely wonderful. Also I let one of the members try some Elmo’s Reserve snuff. He got tears in his eyes so to say. At the end of the evening Endi had a gift for me, a tin of Indonesian made Punakawan tobacco with in it his home-made blend, a flake consisting of Indonesian tobaccos and a bit of the Punakawan mixture. I thanked him (and the others) thoroughly for this and the wonderful meeting I had. Absolutely fascinating, quaint and utterly delightful. Thank you for sharing! Word to the Wise: NEVER read an Arno ‘have pipe-will travel’ report whilst eating! The Bestest Frau In The Whole Widest World had just brought me my evening ‘Vesper’ (that’s German for an evening snack) of a Cheese & HP Sauce sandwich when Gmail kindly informed me that Arno had posted the above article. I got so engrossed in his post that I have just had to rinse out the brown sauce stains from my t-shirt! Damn you, Arno! Can’t recall when i last had to change clothes because something i was reading was soooo interesting it short circuited the connection between mouth and brain! Think Bali sounds more than interesting. I hear what you, Arno say about the strength of Asian street market tobaccos. I think I told you of my recent experience with some Laotian & Thai stuff? You have ever mixed the brown and red sauce? I felt a little sick just reading that! I know you strange continental types put mayo on your fries instead of vinegar as God decreed but DAMN… mixing the sauces?!?!? That’s just perverse. And yes the Thai street tobacco was so strong i genuinely thought I was having a stroke! BTW that is a hell of a name you have there Arno. L.J.M is a dutch abbreviation for something academic or is it a ‘noble’ thing? Wowww… I really do not wish to put that stuff in my pipe..
Well, first I am dumber than a bucket of spit, so no academic title. Second as far as I found out since Napoleonic times my family have been simple farmers. It has something to do with the general Roman Catholic faith of the province I grew up (multiple first names were given to newborn) and with the fact that on both sides of my parents I am the youngest grandchild. So everyone wanted me to be named after them.. Arnoldus is after a great-uncle, Leonardus is after one of the grandfathers, Lambertus is after the other grandfather, Johannes is after my father (Jan) and Maria (yes it is a woman’s name..) is after my mother (Marie-José). The Southern German catholic village from which The Bestest Frau In The World hails has the same custom.Or used to. New borns would often get the name of whichever Saint’s, whose day they had chosen to be born upon, as a second name…even if it was a female saint. Yeah right…says the Dutchman who writes his blog in better English than my native own. If you see how much I still have to look up when I write the blog..
Bali sure interests me now! 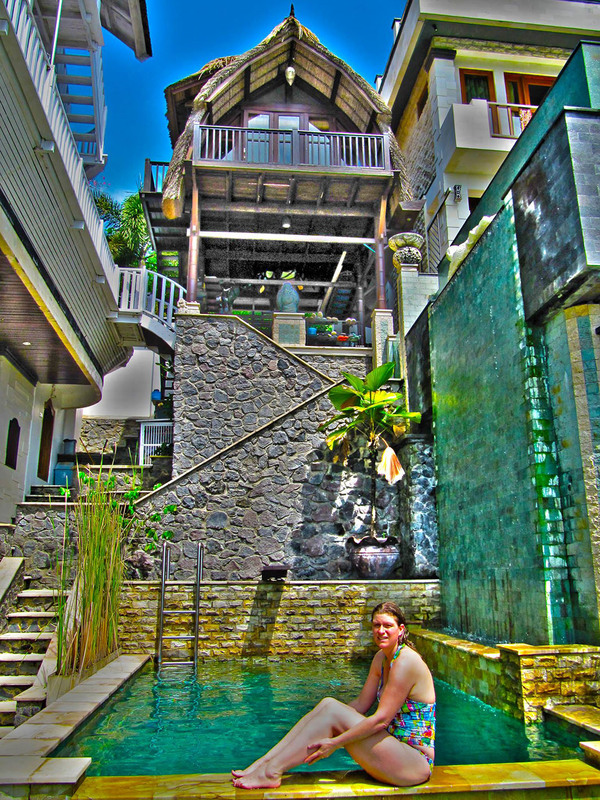 What a beautifull experience and recommendation for for a stay at Home Bali Home from Marcello.